There are plenty of empty places in the United States, but they're all on public lands except for the empty quarter of northern Maine. 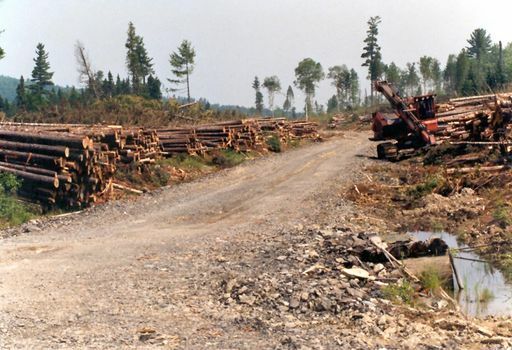 There, west of state highway 11 and north of Moosehead Lake, lie roughly 5,000 square miles of the very private, fee-title property of a few timber companies. 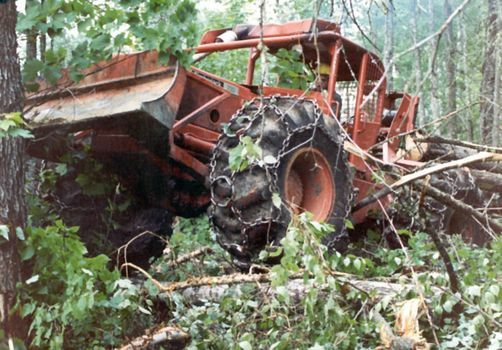 There's no virgin timber left--no room for Northwest logging heroics--and there's also a lot of completely mechanized production, with men in machines, not on the ground. 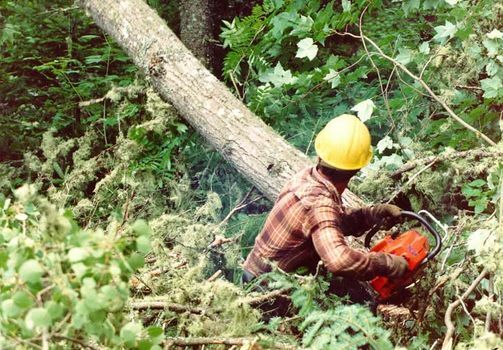 Look around the edges, however, and there are still small contractors working with chainsaws and skidders for some of the smaller landowners. 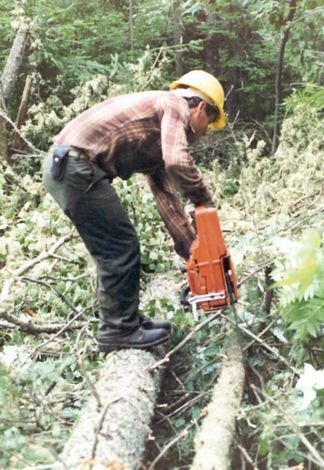 The work isn't as healthy as it was in the days of crosscut saws and oxen, but it's probably as dangerous. 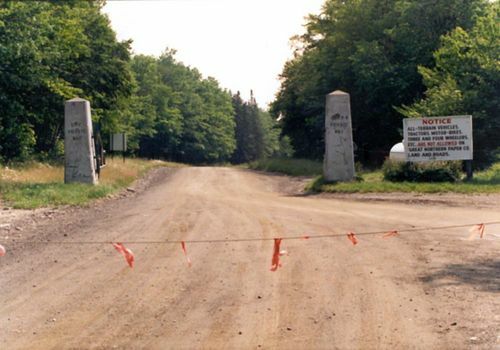 The roads through this part of Maine are private, though the landowners permit controlled public access. 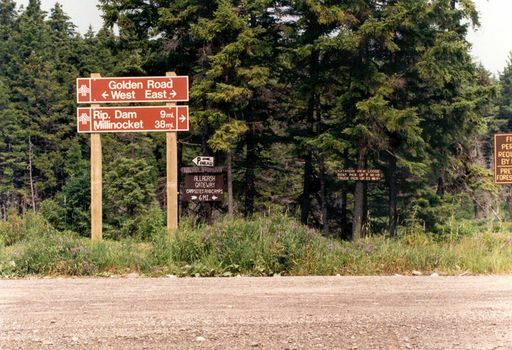 The stylish red signs here are on the Golden Road, built by International Paper for log trucks heading east to Millinocket or west to St.-Zacharie, Quebec. 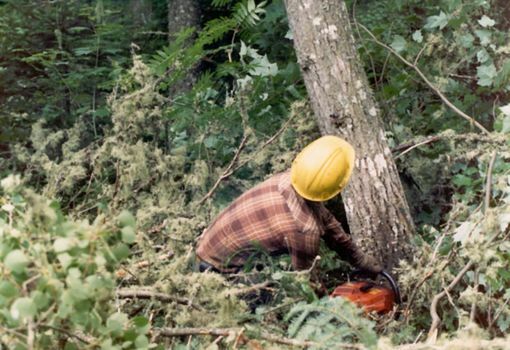 Surrounded by farming--rough pastures in Quebec and potato fields in Maine--the forest economy rests on ownership patterns established in the 19th century, when Maine surveyed these northern lands into gridded townships much like the American Midwest, then auctioned the land in 36-square-mile blocks. This wasn't homestead country, in other words, and the owners (and their heirs, personal and corporate) have never allowed residential development. Want to know where this picture was taken? 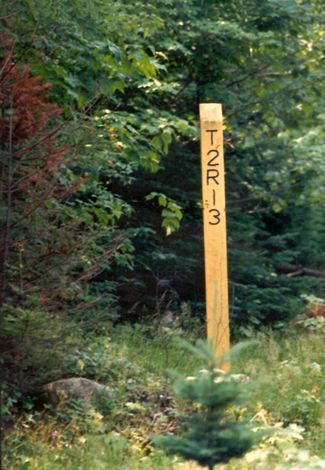 The sign refers to township two north, range 13 west, measured from a basepoint at the southern end of the straight line that forms the northern part of Maine's eastern border. You'll go 12 miles north of that point and 78 miles west of it. An entrance to one of the private roads. These roads operate year-round, despite the long winter. Trucks lose traction on ice only at winter's end, when thaws cover the ice with a film of meltwater. "Pitiful." So say the swaggering fans of logging in British Columbia, where trees like these are called weeds. True enough, and even this "chopper"--the local term--will lament the size of the "stems" being cut these days. Before you get dismissive, however, remember the biting flies around here in the summer, the thickets of undergrowth characteristic of second-growth forest, and--worst of all--four feet of snow half the year. Work goes on. 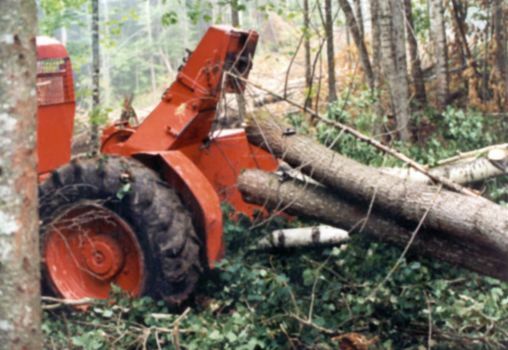 No need to yell "timber." There's nobody to hear. A quick step or two back. 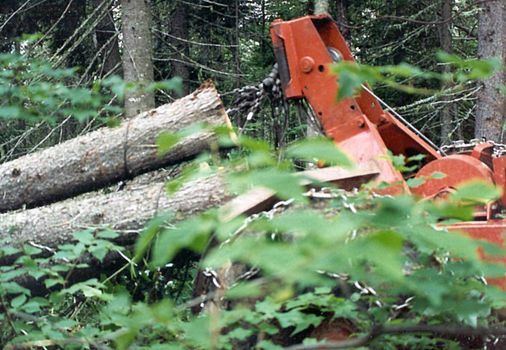 The forest is so thick that a falling tree brings down a lot of other stuff with it, tangling the site. A "no-no:" walking the stem to cut off the branches. It's too easy to slip with that saw still racing, but the ground is such a mess that there's no easy alternative. For the chopper, time is money. Repetitive-stress injuries? You bet. Choppers are finished by their 40s. 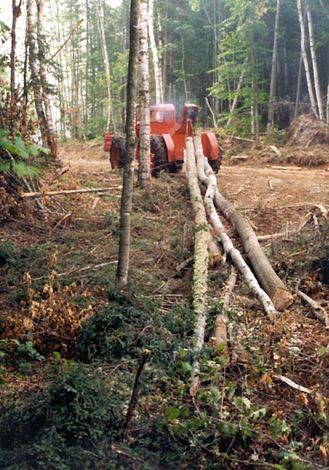 Skidding the logs out to a landing. 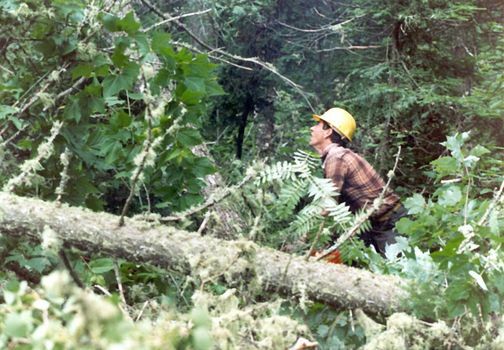 The chopper's partner handles this part of the work and brooks few obstacles. 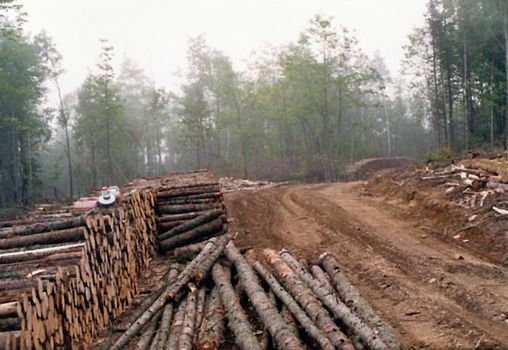 A decent load of almost respectable logs. A smaller set, all "choked" up. 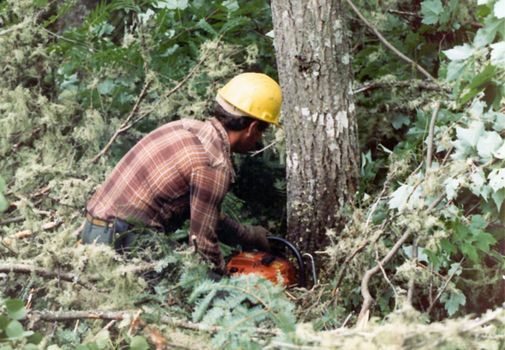 A very large percentage of the wood fiber winds up as pulp or paper. It's been that way since both International Paper and Great Northern started production early in the 20th century. Because most of the wood will be pulped, it's sometimes bucked into 4-foot lengths. It's an obsolete practice but still commonplace on the smaller holdings, where roads like this will be walled for hundreds of yards with shortwood ready for loading. Stacked tree-lengths here. 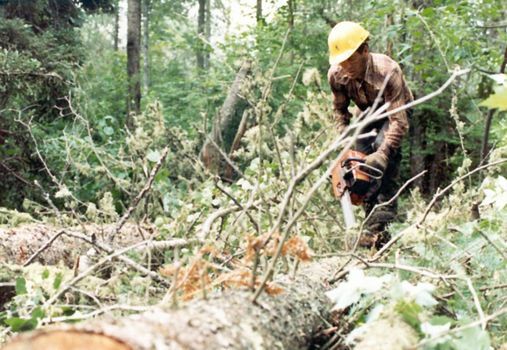 Clearcut is the order of the day. 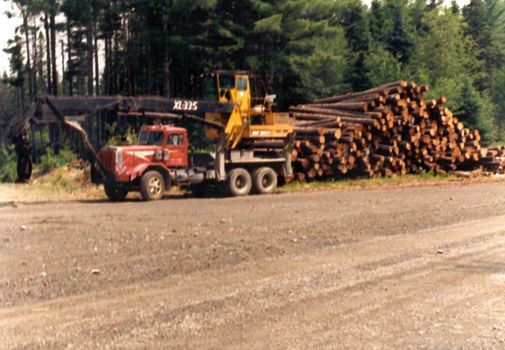 A loader waiting for a haul truck. He'll stack it high and off it will go to the mill.